The 1960s ended with the apparent disappearance of an array of social movements. Some were exhausted, others lost personnel, a few accomplished their limited goals and ceased to have a purpose. Mostly, however, they were redeployed into other projects. Greenpeace is an example of a movement organization that combined a critique of capitalism and Cold War politics with a strong environmentalist sensibility. Established in Vancouver in 1971, Greenpeace opened its first office in Kitsilano, a neighbourhood deeply associated with the hippy movement of the previous decade. Starting out as the “Don’t Make a Wave Committee,” the organization took the name of its first ship, the Greenpeace, for the organization as a whole. The catalyst was American nuclear weapon testing on a remote Aleutian island in Alaska. The Americans, British, and French had been testing atomic explosives in isolated island locations since the 1940s. With an arms race against the Soviet Union well underway, the Americans were eager to both maintain their apparent technological lead, and to do so as close to the Soviet hinterland of Siberia as possible. Environmentalists and anti-Cold War activists saw the proposal to detonate a warhead beneath Amchitka Island (the third test on the island in ten years) as offensive and dangerous. There were fears, too, that the test would cause a tsunami, and that radiation would inevitably seep into the sea. The organization cannily incorporated journalists and media figures into its numbers. Its leaders were principally middle-class professionals who presented Greenpeace as inclusive and open; the opposite of the corporate forces it was fighting. 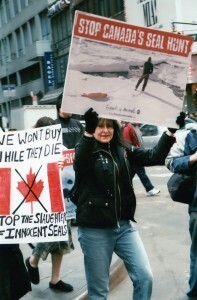 Within a couple of years, the focus of Greenpeace’s activity had shifted to the international whale hunt and, in the late 1970s, the Newfoundland-Labrador seal hunt. This latter campaign pitted the still-mostly British Columbian organization against Newfoundland workers, and was (at least temporarily) highly divisive. Thanks in part to the anti-sealing campaign launched in Europe, Greenpeace quickly became a global brand. Its flag and emblems could be found across the western world and in ports across Oceania. However, it retained a powerful presence in Canada. This would be seen again in British Columbia, from 1992-1996, in the War in the Woods — a mass protest and occupation of old growth forests that culminated in the arrest of 300 protesters in one day. Figure 7.24 The fur trade between Canada and Europe was fundamental to the growth of colonial commerce and population but by the 1980s it had become an economic and moral battleground internationally. From the perspective of Canada, Greenpeace did many incontrovertibly important things in the first 30 years of its existence. It raised awareness of environmental issues as they pertained to the Cold War, global capitalism and consumerism, and the difficulties inherent in policing a mobile operation like the whale hunt. As a movement, it had greater international reach than any other has that originated in Canada. In mobilizing hundreds, if not thousands, of people to put themselves in the way of corporate foes — and at the risk of being arrested and jailed — Greenpeace created a generational cadre of environmental activists and shifted the political agenda (at least in some quarters). Finally, Greenpeace carried forward many of the traditions of the social reform movements we have been studying: largely middle-class, morally forthright, redemptive, and as inclined toward prohibition of offending behaviours as it was to tempering practices. Greenpeace may be contentious in some quarters but it is in many respects an illustration of Canadian historical traditions. Greenpeace originated in the anti-nuclear movement of the 1960s and 1970s, turning its attention to animal rights issues in the late 1970s. Increasingly associated with protests against whaling and sealing, Greenpeace became an international movement in the 1980s, at which time it refocused again on the logging of old growth forests. Founded in Vancouver, Greenpeace was an important late-20th century organization in Canada that drew on the traditions of older reform movements. Stop the Seal Hunt by Alejandro Hernandez. is used under a CC-BY-2.0 license. 7.11 Greenpeace by John Douglas Belshaw is licensed under a Creative Commons Attribution 4.0 International License, except where otherwise noted.